Where Is The Hole In Your Social Media Strategy? Started by the Salvation Army in 1938 to commemorate the “dollies” who supported American troops during World War I by making doughnuts behind the front lines, National Doughnut Day (also spelled donut) observed in the US on the first Friday in June, celebrates these fried circles of dough notable for the hole in the middle. Therefore to honor National Doughnut Day, we ask: where’s the hole in your social media strategy? Here are thirteen notable places where your social media strategy may be missing an important element (aka – have a hole) and actionable social media tips to fill them. No monitoring. This means that you’ve just jumped into the social media conversation without taking the time to pay attention to what’s being said. This can result in your social media communications being contextually irrelevant and off topic. Even worse, you could have a problem brewing and not know it. Actionable Social Media Tip: Start listening to the social media ecosystem. Ideally, use a social media tracking platform. At a minimum, establish a presence and take time to learn about your market. Also, set up appropriate Google alerts. This isn’t fail proof but it’s a start. No specific goals. As with any activity in business, you must set appropriate, specific objectives. The more concrete the better. “Generate ten new leads in three months” is better than “Improve sales.” Actionable Social Media Tip: Determine goals for your social media activity. They should be aligned with your business and marketing goals. No understanding of where your audience engages on social media. Customers use social media for a variety of reasons from keeping up with family members to gathering information. They also participate across a diverse set of platforms. Actionable Social Media Tip: Create a social media persona to ensure that your social media strategy is aligned with your target market’s activity. No content beyond one-way promotional blasts. Posting promotions on social media are a no-no. Social media isn’t another third party media site where you can place promotional content and advertising. Actionable Social Media Tip: Curate a mix of content on social media. Keep your information about your organization to about one piece in ten. No branding. The comments and content that you post on your social media profiles must incorporate your brand so that participants can identify it as yours without spending time thinking about it. Actionable Social Media Tip: Extend your organization’s branding to present a 360° brand to support your marketing efforts. No special formatting or targeting in the content you post on social media. If your content is difficult to consume, then potential prospects move onto the next piece of information. Actionable Social Media Tip: Bear in mind that you must make it easy for prospects to consume your content regardless of device they’re using. No optimization for search. One of the strengths of incorporating social media into your marketing mix is improved search results rankings and the fact that social media and other content formats now appear on SERPs (search engine results pages). Actionable Social Media Tip: Ensure your social media is focused on your top keywords. Also, add text to your non-text content. No supporting advertising. Social media strategy can benefit from the use of targeted social media advertising. It’s highly targeted and can yield amazing results. Actionable Social Media Tip: Assess where it makes sense to add a targeted social media advertising budget. Jon Loomer sings the praises of Facebook’s ad offering. Orabrush CMO Jeffrey Harmon spent $28 on Facebook ads to get Walmart distribution. No executive engagement. Many senior executives avoid social media. While you probably don’t want your c-suite trolling Facebook all day, if President Obama can engage on social media so can they! Actionable Social Media Tip: Create targeted opportunities for senior executive interaction. For example, blog posts, presentations on Slideshare, videos, podcasts and/or Google hangouts. No integration with the rest of your marketing. Social media isn’t a stand-alone marketing tactic. It requires support from other aspects of your marketing mix and helps extend your other marketing. Actionable Social Media Tip: Establish a checklist of elements where social media requires support from the rest of your marketing as well as where social media can expand your marketing reach. No dedicated staff. The bottom line is that if social media isn’t part of someone’s job description, it won’t get done. Actionable Social Media Tip: Make sure that social media is a key part of someone’s responsibilities. Also, create a set of social media guidelines to ensure that employees know what they can and can’t do on social media as an employee and in their private life. No budget. While many social media platforms are free to establish a presence or profile, they require an on-going stream of fresh content. Actionable Social Media Tip: Create content that supports the purchase process such as answering customer questions, providing styling, offering patterns and/or recipes and/or showing customers how to use your products. No way to track results. Social media yields measurable results as recent Syncapse research shows. That said, you must plan for success. This means that you need to determine what you’re going to measure and have a way to track it. Actionable Social Media Tip: Incorporate a call-to-action to nudge prospects to respond. 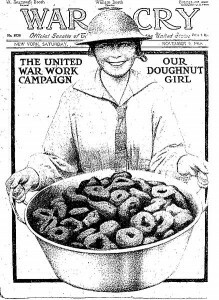 Learn from the Salvation Army’s World War I Doughnut Dollies who made easy-to-cook confections to feed the troops that you must find a work around to ensure your social media strategy doesn’t have a hole in it. What other holes have you discovered in your social media strategy? What did you do to fix them? Sign up for FREE Daily Emails! Tags Jeffrey Harmon, National Doughnut Day, Orabrush. Bookmark the permalink. 4 Responses to Where Is The Hole In Your Social Media Strategy? The two shortcomings that you have pointed out that are the most common causes of failure for most social media marketing efforts are having no budget to maintain your social presence and not monitoring the results of your posts. Too many businesses think that social media marketing is about setting up a brand page, making a few marketing posts and letting the traffic take care of itself. In reality social marketing is about making a large number of personal connections with your potential customers which takes time and money to do well. Nice article Heidi on how important social media strategies are! We’re finding that more companies are hiring social media managers (I work for a marketing recruitment agency) so it seems that social media is being taken seriously. It is such a powerful tool. A great overview of social media beginners! a very nicely paced presentation. It’s not about his worthy words that depict the social media; it’s about influencing and inspiring people using his Heart. Bringing them as one to achieved goals and success. Hi Heidi, in my opinion social media has only just began to realize the importance of marketing. Take a look at what’s currently going on at Facebook and you will see what I mean.